A leading doctor is today leading calls for the Welsh NHS to improve its medical training after his mother died of a heart attack following ‘inadequate care’. 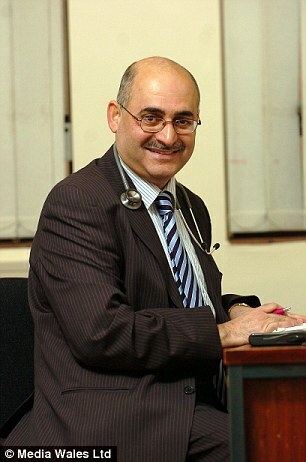 Dr Amer Jafar, one of Wales’ most senior medical consultants, was awarded £4,000 compensation after an investigation uncovered a spate of failings in the care of his 79-year-old mother. Dr Jafar called for the investigation after he said ‘unimaginable mistakes’ were made at the University Hospital of Wales in Cardiff over his mother Zahar Al Hasani’s death. A report found there was a three-and-a-half hour delay in identifying and treating her condition when she was taken into hospital.It also found there was a similar three-hour delay in giving her pain relieving paracetamol and then a six hour delay in giving her antibiotics. Dr Jafar made a complaint to the health board after claiming his mother’s poor care had led to her suffering a fatal heart attack in March 2014. He said his elderly mother, who had a history of heart disease, was assessed wrongly by a doctor in his final year of training who ‘misdiagnosed and mismanaged’ her sepsis and failed to follow the ‘sepsis pathway’.